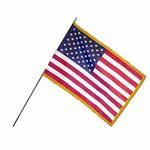 Back to school is here and now is a great time to order your American classroom or homeroom flags. 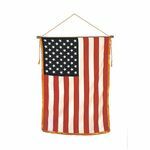 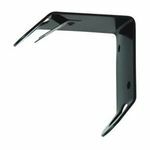 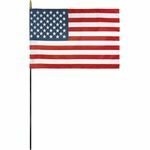 Our United States flags are made in the U.S.A. and come mounted on a finished black wood dowel with a gold spear top.United States classroom banners come mounted on an attractive ebonized crossbar with gilt spear ends and a gold cord and tassels for hanging. 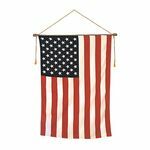 These American flag banners are available with or without gold fringe.